The package, once opened, smelled deliciously like Andes mints. Upon unwrapping the foil jacket, however, I was greeted by a frightening sight: that pretty seafoam-colored picture on the bag is very deceiving, Addicts, because these things are alien green. Yes, alien green. And weirdly translucent. And shiny and sticky and greasy. (All of my favorite things!) Fortunately, they smelled like the Mint Chocolate Chip ice cream of my youth, which allowed me to shut my eyes tight and pop one in my mouth. To my surprise, it actually tasted a lot like the ice cream I remember, right down to the hint of textural complexity provided by the minuscule chocolate chips. And although I have difficulty appreciating the ice cream flavor disassociated from its frozen, melty goodness, I suppose this would be a nice option for those of you whoâ€™ve always dreamt about carrying ice cream cones around in your pocket. 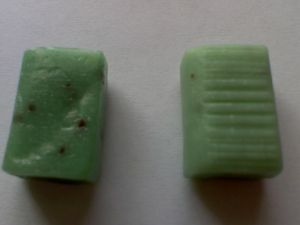 Unlike their sugar-laden counterpart, these candies actually resembled that picture on the bag, with their soft green coloring, opaqueness, and relatively matte finish. They had good flavor up front, but were more crumbly in the mouth than the original and tasted a little chemically and overpoweringly minty at the end. Overall, theyâ€™re not as true to the Mint Chocolate Chip flavor as I might want. These ones were much prettier, looking very much like pink Starbursts with tiny red specks; however, they were still greasy, sticky, and Play-Doh-y. Now, Iâ€™m not a big strawberry ice cream fan – I prefer my fruit flavors not to be cut with creaminess – so I didnâ€™t have high hopes, but I was pleasantly surprised when a nice berry flavor kicked in about halfway through the chew. Unfortunately, the candies were so small and dissolved so quickly that it didnâ€™t last for very long. Sadly, the mid-way burst of flavor that saved the originalâ€™s rep didnâ€™t come to fruition (ha!) in the sugar free version. Interestingly, this resulted in a flavor more akin to strawberry ice cream though, so if you like that, I guess it could work in your favor. This one, like the Sugar Free Mint Chocolate Chip candy, had a strange texture that almost felt like crumbly, crystallized sugar. So Iâ€™m not a huge fan of these but if they really scream out to you for some reason, Iâ€™m gonna go ahead and say that this is really a go-for-the-full-sugar-version-or-go-home kind of situation. Editor’s Note: I thought these were pretty darn foul. Admittedly, I only tried the regular mint version, but I thought the flavor was weak and the strange little bits of texture did absolutely nothing for me other than make me wonder if they hadn’t mixed all the ingredients completely. Then again, I was never a huge fan of the ice cream version, so they may well be more appealing for folks who like the original form. Yeah, these sound really good. I need to find some of these. I love mint chocolate chip. I’ve had the hard ones and they rock. All you made me do is want Starburst, dang it :-). I agree with ajewel. Starbursts sounded really good right now. These seem too creamy. I like alien green. If I want mint choco-chip…I’m going all out and getting a scoop of real ice cream! I’ve seen these on the racks and have never had the desire to try them. You can’t replace the goodness of a good scoop. Thanks for the review, though. :) Now I know that I’m not missing out. Great. And they come with varieties also. If you have diabetes you could eat the sugarfree. Thanks for the share. ew….that sounds gross, and looks gross to…. After rummaging through the giant box o’ candy that sits in caitlin’s living room, I tried a piece of this. 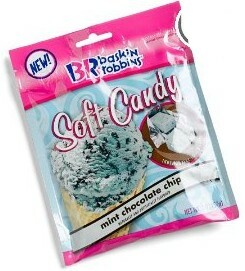 I love mint chocolate chip ice cream, but this candy is disgusting. It actually kind of tastes like the ice cream… but instead of that ice cold refreshing creaminess, it’s a dull room-temperature chewy lump. Blech. It’s just wrong. Hah! Wow. I’m pretty sure I don’t know about you all here… but these sound delicious! It doesn’t look gross to me. I like the ice-cream version, but I prefer Ben&Jerry’s better, hands down. Though, this candy looks amazingly inviting. There is a hard candy version as well, many flavors of them. I tried 1 and I loved it! We recently reviewed the sugar free Very Berry Strawberry and have fallen in love with them. Most acceptable sugar free candies are primarily dark chocolate derivatives, but the burst of strawberry flavor is a welcome detour! i brought these today because it looks so delicious from the picture and from the description on the back. As soon as I opened it, my hand was full of grease. bad! 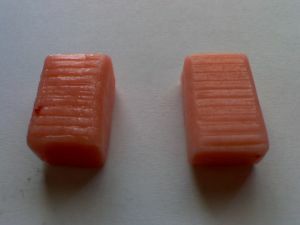 then when i ate it, it wasnt like a chewy starburst or like japanese morigana hichew type candy. It broke away in my mouth like cheap gum.